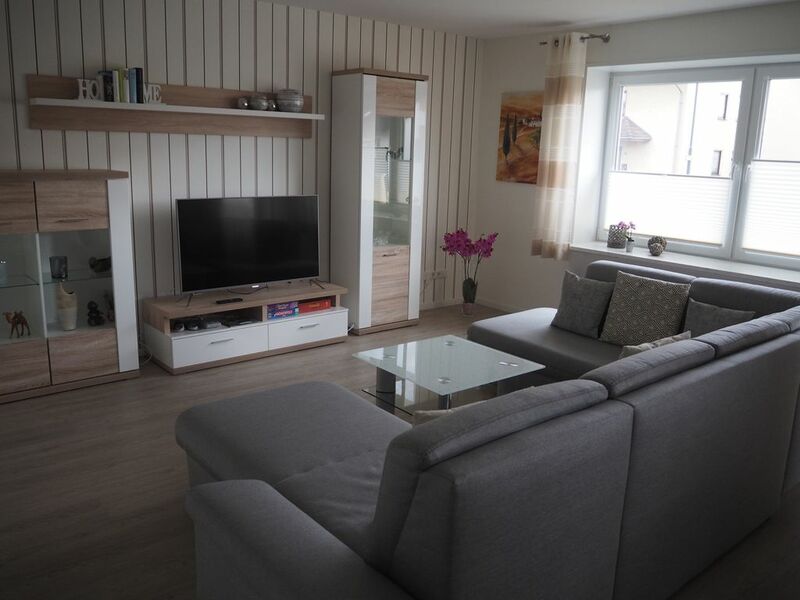 Our apartment is located on the ground floor of a two-family house in Künzell. The apartment is approximately 110 square meters and has 2 bedrooms, 1 living room with dining room, a kitchen with adjoining dining area, 1 daylight bathroom and 2 balconies. The living room has a large couch, a 49 inch TV with Netflix and a Nintendo classic mini. The kitchen is equipped with a stove, toaster, oven, microwave, Senseo (pad) coffee machine, egg cooker and dishwasher. The community Kunzell is located about 4km before the gates of Fulda and offers a good starting point to get to know the city. By car you need about 10 -15 minutes to the city center or you take the bus, which runs every half an hour. Likewise, a detour to the Rhön is possible. The Wasserkuppe is about 30 minutes away by car or can easily be reached by bus. In Künzell you will find everything you need for your daily needs. In a few minutes walk there is a supermarket / bank / pharmacy / hairdresser. In the immediate vicinity is the thermal baths Sieben Welten, which invites you to sauna and relax. As a further leisure time activity the laser factory (laser day) or for the smaller guests the Takka Tukka country is recommended. I would be very happy to welcome you as my guests. Ausstattung lässt keine Wünsche offen! SUPER! Die helle, freundliche Wohnung ist modern und geräumig. Sogar Küchenrolle, Geschirrtabs, Spüllappen, Alufolie,... alles vorhanden!! Sehr engagierte und hilfsbereite Vermieter!